Posted on April 21, 2017 , in Treadmill. If you love the rush that running gives you and are thinking about investing in a treadmill, you’re probably wondering how to choose from the huge range of available options. Below you’ll learn about common mistakes you’ll want to avoid as you make this important decision. 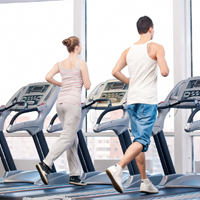 Commonly, lower-end treadmills are packed with features that are not necessary. By adding these features, the manufacturer is attempting to mask what the treadmill lacks in quality. For example, some machines will give you a free heart rate monitor, but upon closer inspection you’ll see that the motor is only 1.5HP, which will wear out quickly. A treadmill may feature over 30 workout programs, but if it doesn’t have a warranty, it’s not worth buying. Make sure to prioritize the essential qualities you want your treadmill to have and ensure that they’re there before you start considering the bells and whistles. The motor is the treadmill component that is most expensive to fix, so a powerful, high-quality motor should be a huge priority when choosing the right piece of equipment for you. Knowing the differences between “peak duty” horsepower and “continuous duty” horsepower is absolutely essential to choosing the right treadmill. Peak duty horsepower refers to the highest power level the motor can run at, but this doesn’t mean it can run at this level for long without overheating. What you want to pay attention to is the continuous duty horsepower, which is a far better measure of how much power the motor can supply. This number refers to the power the treadmill can operate at for 24 continuous hours without slowing. So, if a dealer shows you a “3.0 HP motor” at a price that seems too good to be true, make sure they’re not talking about peak duty horsepower, which is likely! While it’s okay to understand your budget and avoid overspending on a treadmill, it’s also important to understand that price can also reflect quality. Low-quality, low-priced treadmills can hurt your joints, create back problems, and require more expensive maintenance and repairs, so you’ll want to beware of them. This doesn’t mean you need to buy a $4000 commercial-grade treadmill, but you should know that spending $1000 to $1500 will provide you with many high-quality options. Before you begin shopping, don’t forget to make a list of your needs. Consider your height, weight, and how much you plan to run. Then choose a treadmill that is right for your size and fitness goals. For example, if you have back problems, choosing a power folding treadmill will prevent you from having to stoop and reduce back strain. If you’re very tall, you’ll need a longer running surface. Now that you know about common mistakes to avoid when looking for a treadmill, download this month’s promotion and save on treadmills and other fitness equipment.